sailboat. : The Lipstick Tag! A couple of weeks ago I was tagged by the beautiful Sophie from A Hint Of Sparkle to do the lipstick tag. I had a lot of fun reading Sophie's answers and looking at the pretty pictures of her impressive collection so I'm excited to be sitting down to have a good ol' natter about some of my favourites. Around 25, give or take a few that might currently be lurking in handbags or around the house. I haven't counted tinted balms, liquid lipsticks or gloss stains because I'm not sure if they really count. That seems like rather a lot, I think maybe it's time to finally throw out the ones that are getting a bit old. Oh gosh, I'm not sure. I thought it could have been one of the Natural Collection lipsticks but I actually think it might have been one from The Body Shop because that's where my Mum took me to pick out my first few bits of make up. Although I'm pretty sure I just got a mascara and some powder the first time, I think I remember going back to pick out a really light pink blush and lipstick to match not long after. I don't own the tube anymore because back then I was a 'buy it, use it all up and then buy another one' kind of girl. Sometimes I wish I was still a little more like that, but I think I'd miss having options! 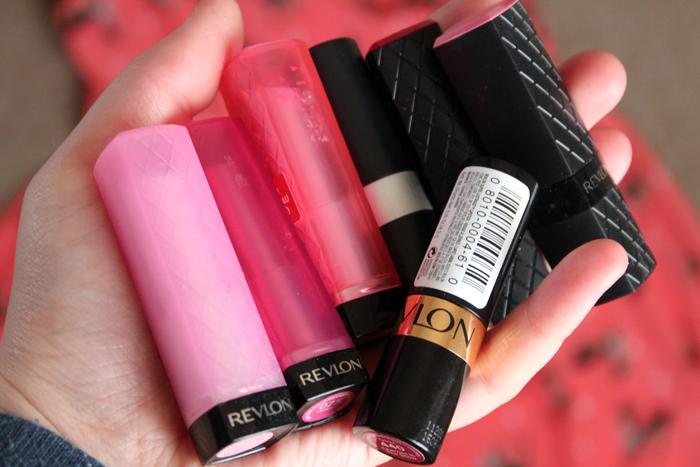 Overall I think Revlon is a winner for me because they have so many different options. They have their regular line of lipsticks with such a huge variety of colours and then they have their Lip Butters, which are lovely and the Balm Stains, which I also really like. I do have to give an honourable mention to Topshop here too though because their colours are always stunning! I'm not sure if this really counts, but I'm counting it because it's in a lipstick tube and it's the Revlon Lip Butter in Cupcake. I think this is my third or fourth tube of this and I like it because it applies really smoothly and it's the perfect light pink that adds a touch of brightness and colour to my face without being over the top. I go through real phases with the kind of finish I like. At the moment though I like really creamy formulations that aren't too heavily pigmented and don't feel too heavy on my lips. 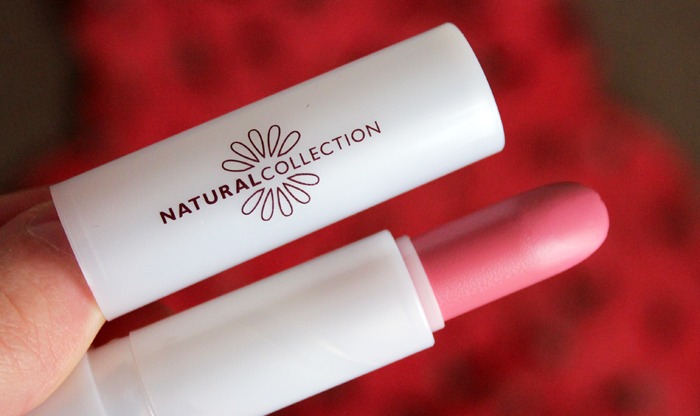 Another tube of the Natural Collection Moisture Shine in Pink Mallow. A really easy to wear pink shade that I like to keep in my handbag. 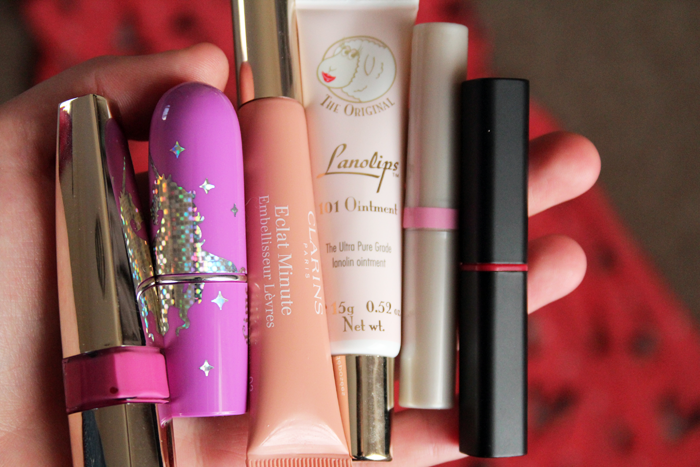 Okay, I just went to have a little dig around in the bag I'm currently using and shamefully I found...six lip products. Oops! I have one of the L'Oreal Stain Splashes in Marilyn, a Lime Crime lipstick in Great Pink Planet*, a Clarins Lip Perfector, Lanolips 101 Ointment*, a Carmex tinted balm in pink* and an ELF tinted balm in Rose*. I don't think anything will ever beat Revlon Cherries in the Snow for me, it's just perfect. Most of them are all mixed in with my glosses in my acrylic storage drawers but I have some of my favourites in a little acrylic lipstick holder that I keep on top of the drawers. Leave a link in the comments if you've done this tag, I'd love to read your answers! 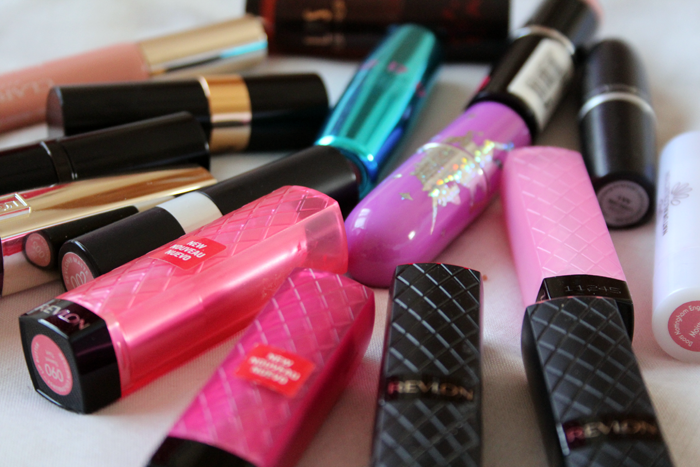 Oh I love lipstick… for me it's the easiest beauty product to use and change how your face looks. I love the Revlon lip butters, Berry smoothie is probably my most worn :) Love that acrylic holder- where did you get it from!? I love my Chanel shine lipsticks, they go on so well and last for hours! Very interested in the collection lipstick, such a lovely colour, where did you get your lipstick holder? Its so cute! Would be lovely to actually display my lipsticks like that! I love this tag but I don't think I have may lipsticks to actually do this. I might do it in the future when my collection grows but I did love your answers to these. Lovely post! I still have my first lipstick, shamefully, as I don't wear any of my lipsticks as much as I should. I'm still in love with the Lime Crime lipstick packaging! Haha wow! I think I only have about 4 lipsticks that I barely use. I love how it can change up your look so easily but its just a hassle for me to constantly reapply. I bought a lip primer from UD recently so maybe that'll change...? Love this tag! Lime Crime lipsticks are so gorgeous! Great tag, I'll definitely do it! I wouldn't recommend the Chanel Rouge Coco Shine lipsticks all that much! I have one in evasion and although it is gorgeous it only lasts an hour or two and then my lips are left drier than when I began! i'm dying to try a lime crime lipstick! That is such a neat collection! 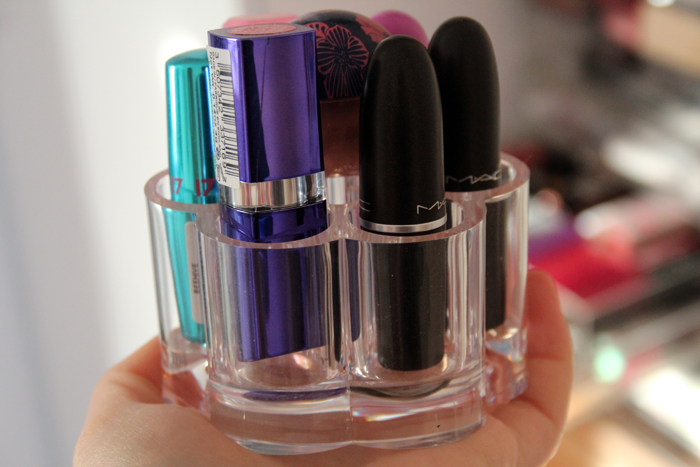 I love the lipstick holder — perfect for the shades that you use most often. I'm awful — I'm pretty sure that I have roughly 60 lipsticks! I just can't help myself, and I always buy them as a pick-me-up when I'm having a rough day. Wow, you do have quite a collection there! Love this TAG might have to do it myself! 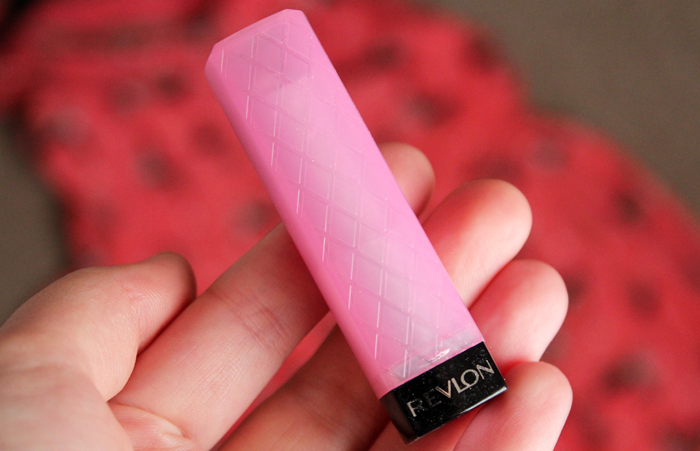 Ah now I need Revlon Lip Butter in Cupcake in my life. If you've been through that many of them it must be good! 6 lip products in your bag!? Impressive! I probably only have 3 lippies, waaaah. I need to work on sorting out my lips this year, I get so self-concious because they're so small and never really know what to do with them. I do love tinted lip balm!